d. at Ubeda, Andalusia, 14 Dec., 1591. John de Yepes, youngest child of Gonzalo de Yepes and Catherine Alvarez, poor silk weavers of Toledo, knew from his earliest years the hardships of life. The father, originally of a good family but disinherited on account of his marriage below his rank, died in the prime of his youth; the widow, assisted by her eldest son, was scarcely able to provide the bare necessities. John was sent to the poor school at Medina del Campo, whither the family had gone to live, and proved an attentive and diligent pupil; but when apprenticed to an artisan, he seemed incapable of learning anything. Thereupon the governor of the hospital of Medina took him into his service, and for seven years John divided his time between waiting on the poorest of the poor, and frequenting a school established by the Jesuits. Already at that early age he treated his body with the utmost rigour; twice he was saved from certain death by the intervention of the Blessed Virgin. Anxious about his future life, he was told in prayer that he was to serve God in an order the ancient perfection of which he was to help bring back again. The Carmelites having founded a house at Medina, he there received the habit on 24 February, 1563, and took the name of John of St. Matthias. After profession he obtained leave from his superiors to follow to the letter the original Carmelite rule without the mitigations granted by various popes. He was sent to Salamanca for the higher studies, and was ordained priest in 1567; at his first Mass he received the assurance that he should preserve his baptismal innocence. But, shrinking from the responsibilities of the priesthood, he determined to join the Carthusians. However, before taking any further step he made the acquaintance of St. Teresa, who had come to Medina to found a convent of nuns, and who persuaded him to remain in the Carmelite Order and to assist her in the establishment of a monastery of friars carrying out the primitive rule. He accompanied her to Valladolid in order to gain practi cal experience of the manner of life led by the reformed nuns. A small house having been offered, St. John resolved to try at once the new form of life, although St. Teresa did not think anyone, however great his spirituality, could bear the discomforts of that hovel. He was joined by two companions, an ex-prior and a lay brother, with whom he inaugurated the reform among friars, 28 Nov., 1568. St. Teresa has left a classical description of the sort of life led by these first Discalced Carmelites, in chaps. xiii and xiv of her "Book of Foundations". 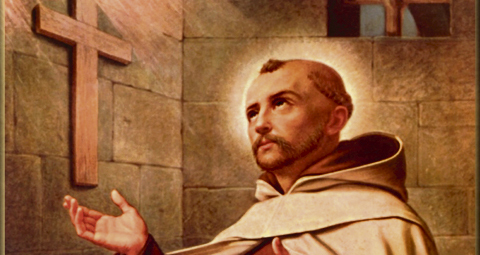 John of the Cross, as he now called himself, became the first master of novices, and laid the foundation of the spiritual edifice which soon was to assume majestic proportions. He filled various posts in different places until St. Teresa called him to Avila as director and confessor to the convent of the Incarnation, of which she had been appointed prioress. He remained there, with a few interruptions, for over five years. Meanwhile, the reform spread rapidly, and, partly through the confusion caused by contradictory orders issued by the general and the general chapter on one hand, and the Apostolic nuncio on the other, and partly through human passion which sometimes ran high, its existence became seriously endangered. St. John was ordered by his provincial to return to the house of his profession (Medina), and, on his refusing to do so, owing to the fact that he held his office not from the order but from the Apostolic delegate, he was taken prisoner in the night of 3 December, 1577, and carried off to Toledo, where he suffered for more than nine months close imprisonment in a narrow, stifling cell, together with such additional punishment as might have been called for in the case of one guilty of the most serious crimes. In the midst of his sufferings he was visited with heavenly consolations, and some of his exquisite poetry dates from that period. He made good his escape in a miraculous manner, August, 1578. During the next years he was chiefly occupied with the foundation and government of monasteries at Baeza, Granada, Cordova, Segovia, and elsewhere, but took no prominent part in the negotiations which led to the establishment of a separate government for the Discalced Carmelites. After the death of St. Teresa (4 Oct., 1582), when the two parties of the Moderates under Jerome Gratian, and the Zelanti under Nicholas Doria struggled for the upper hand, St. John supported the former and shared his fate. For some time he filled the post of vicar provincial of Andalusia, but when Doria changed the government of the order, concentrating all power in the hands of a permanent committee, St. John resisted and, supporting the nuns in their endeavour to secure the papal approbation of their constitutions, drew upon himself the displeasure of the superior, who deprived him of his offices and relegated him to one of the poorest monasteries, where he fell seriously ill. One of his opponents went so far as to go from monastery to monastery gathering materials in order to bring grave charges against him, hoping for his expulsion from the order which he had helped to found.